Howdy from sunny, warm Texas! I hope you all took time this holiday to spend with your horses – if you have them – and your family and friends. My holiday has been filled with all things horse and family, and I am incredibly grateful for the fact that even though I don’t have my own horses in Colorado, my folks have them here in Texas – and they’re happy to have me visit every once in a while! From Texas, I’ve been watching the weather reports for Colorado, where it looks very cold and snowy. I can’t help but think of Traveler and the others, but I’m certain they are all well and happy. 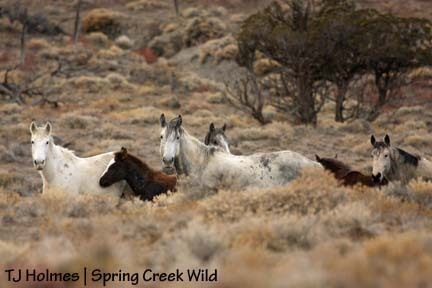 Text of the email: The Obama Transition Team is currently taking suggestions and votes on America’s “top ideas.” With only two days left, a call for a Congressional investigation of BLM’s administration of the Wild Horse and Burro Program has been submitted, but it needs to get at least 1,000 votes if it is to move up to the “next round”! 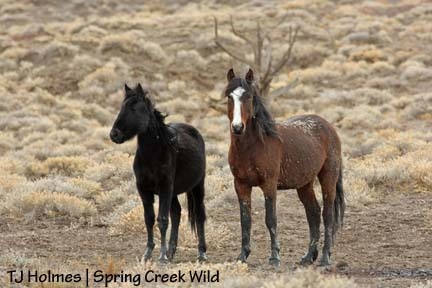 The deadline is December 31st for this critical opportunity to demand accountability on behalf of our wild horses and burros. It is imperative this idea make it to the next round. If this idea moves on, a new round will begin and the Top 10 Ideas will be presented to the President on his inauguration day. Please don’t let this unique opportunity slip by! In order to vote, you have to create an account or sign in to the Transition Team’s website. What that really means is the new girls have found a beau! David Glynn, who was out both Saturday and Sunday last weekend, emailed this week to say he saw the girls Sunday with “companions.” Wow! They got pushed down out of the hills by the cattle, and that’s how they came to mingle. I could tell you the name of this less famous “Bachelor” (he’ll never make it on the more famous show), but I’m going to mimic my own suspense and keep you waiting (or you could cheat and scroll all the way to the bottom). A big snow storm (it’s supposed to last until about Thursday) is headed our way, but I wanted to get out to the ponies one last time before I head south for the winter holidays. Two weeks ago when I went out, the road was muddy enough that I parked at the corrals and hiked in – but while the ground was “soft,” it wasn’t really muddy. This time, the road was perfectly dry to drive in on, but the rest of the ground was slick, slippery, gooey … absolute mud. And snow was still in patches all over the place. The wild thing was that if you looked south, the landscape looked all white and wintry, but if you looked north, it looked the same golden brown as usual – the pattern of snowmelt. Steeldust and his band were out southeast of the pond close to the entrance, so I parked just down the road to the old trap site and hiked out. I realized pretty soon that the quality of the basin road would deteriorate between the high ground just in from the entrance and the shady side of Filly Peak, so I decided to leave the Jeep and do another walkabout. Naturally, the bachelor-formerly-known-as … ha, thought you had me, eh? Anyway, the boy had the girls waaaaay out on the northeastish side of Round Top, and I had to wait that long to see them, so you’ll just have to wait. In the meantime, I had a really great visit with the babies (particularly) in Steeldust’s band. Remember on my walkabout two weeks ago, muddy Ember was chasing everybody around? Turnabout’s only fair in play, and this time, it was Storm who was little Mr. Ornery. One of the funniest things about this picture is the fact that Kestrel and Sundance barely moved from these positions the whole time I was there, despite all the young energy swirling around them. Ember was so concerned about me walking toward them that she actually laid down a few seconds after I took the the first pic. Zoomed back in – do you see that Storm has a leg over Ember’s neck? Until she couldn’t stand it anymore! So much for taking a nap. But of course Storm wasn’t out of potential playmates. Just to the right, Luna was napping on her feet while Steeldust grazed (Mouse was even farther right) and Pinon tried to go unnoticed. Not having much luck with big sis, Storm tried his luck with big brother Pinon. Notice Sundance there on the right. 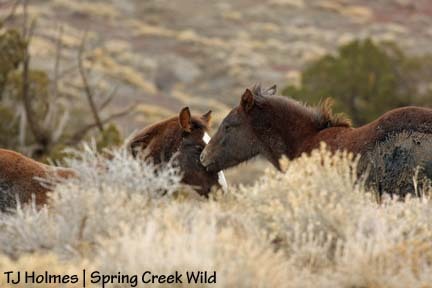 Notice now that Pinon managed to get away from Storm and hid behind bigger brother Sundance, who became a protector without moving a step. But moments later, Storm was at him again. Mama, Storm won’t leave me alone! Might as well take advantage. Sweet girls, but notice the drama in the background. Have I mentioned that the babies still all seem to be nursing? Little sisters ARE good for something … like when you have an itchy face. Lovely Alpha is the color of snow. 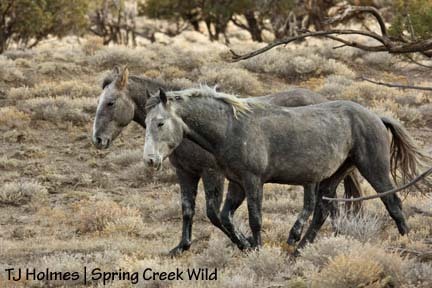 Another zoomed in view of the youngsters – you can just see Pinon’s ears in the background. Three of the bachelors were close, so I went to see them, thinking that Hollywood and his girls and the missing bachelors and possibly the new girls were just out of sight over the hill. Duke, Hook (back) and Chrome maintain their bachelor status. Points to you if you know the remaining three bachelors! But Hollywood and the others weren’t over the hill or beyond the next ridge. 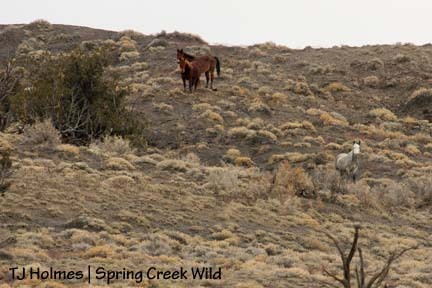 In fact, from the top of a hill above Spring Creek, I could see a lot of country but no other horses. 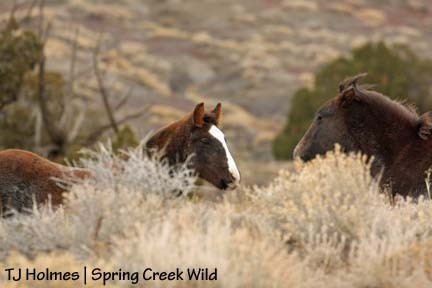 Because I had seen a lot of horses recently in the Flat Top-Round Top area, I decided to walk on out there to see what I could see. I hit the road just before the first Spring Creek crossing and walked it all the way to the base of Round Top. It was really muddy, snowy, slightly less muddy and snowier in spots, and I think my trusty hiking shoes are toast (Santa, are you reading?). I finally spotted a group of five horses between the road and Flat Top, but I thought I was looking for a group of nine horses, and Grey/Traveler and his band were in that area last week, and though the horses were darkish, I thought that could have been because of the weak light, mud and/or a horse out of sight below a ridge. I thought it would be too easy to find Hollywood – and the new mares – that quickly. So of course it was Hollywood, Piedra and Baylee … and two bachelors. Guess who? They were far enough off the road, and I was far enough from a good view of the area around Round Top, and the mud was such a deterrent, that I decided not to go down and take pictures of them. Onward. Bounce and Gaia came into view next – they were near the roller-coaster ridge pond. Dark Alegre was close by. For the same reasons as above – and one other – I decided not to go down to them, either. That “other” reason is that I had spotted – through the binocs – the dun girls up in the trees on the east side of Round Top! Just call me a horse-findin’ fool. By this point, I knew who had the girls because of the bachelor missing from Hollywood’s group (and you all peeked, I know you did! ), but oddly enough, I never actually saw him until I got almost to them. These girls are smart. They already know me, so they weren’t worried at all when I came into view from the trail around the north side of Round Top. That makes me feel really good! The apricot dun mare – look at her gorgeous winter coat! It was so still when I arrived in the basin that morning that I noticed it as soon as I stepped out of the Jeep. It’s always so windy out there, when it’s NOT, it’s a noticeable absence. You can HEAR the silence. But at almost 1:30 on the nose, the wind suddenly picked up out of the south-southwest. It was just above freezing when I arrived, and the Jeep showed 42 degrees when I got back, but I was plenty warm while walking. 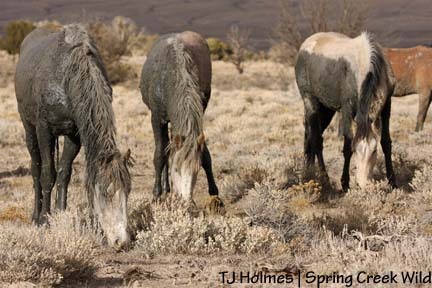 I spent enough time being still with the mares and their boy that I started to get cold, and I was envious of their thick coats! Are you dying to know?! I know you all cheated and scrolled down, but drum roll, please …. Knock me over with a feather. Kreacher was low man on the Bachelor 7 totem pole, but he’s the only one I know of that actually had a band previously (Molly and Roja, with Seven now), so maybe that helped him. He is not what I call an outstanding stallion, and his personality is so laid back as to be prone on the ground, but I have become fond of him this past year. He did NOT act like a stallion when I showed up, but I’m unsure whether to attribute that to him knowing me and being comfortable with me, too, or being timid. The mares still interacted with each other (black mare still kind of poopy toward the apricot dun but not quite as much as before), but although they didn’t seem to mind Kreacher’s presence, they pretty much ignored him. (I’m sure they got a lot of the “get to know you” out of their systems in the past week together.) Another un-stallion-like behavior of his is that he stayed behind them almost the whole time; he never came up front to “protect” them. Again, because he knows me or something else? The only time he was closest to me was after they had passed me on their way up to the “saddle” and I crossed behind them back toward the trail and he just happened to be in back, and thus, closest. I wish all of you a very merry Christmas and all the best in the coming year. I hope it’s as full of joy and wild beauty for you as the past year has been for me. Grey/Traveler and his band showed up on the northwest side of Flat Top as I made my way back to the Jeep. Steeldust and his band and hangers-on had moved to the other side of Spring Creek, so I was glad I had my earlier visit with them. It was a very long walkabout (about 5.5 hours) and well worth every minute! The day was solidly cloudy … until the very last moments of sunset. As I was driving up the curvy-curvy road out of the Dolores River canyon, the above view stopped me in my tracks – literally. If you’ve been on that road, you know the view begs for a pullout (or five), but there aren’t really many good places to stop and get off the road. So don’t tell the authorities, but I pretty much just stopped in my lane and pointed the camera out the window. Besides the (fading) glow, do you recognize what makes this view so significant? That’s the home of my ponies out there underneath that glowing sky. At the almost-very-far-right is that prominent, unnamed peak you can see from almost anywhere in the basin. Pretty beautiful, eh? Who wouldn’t think “Christmas card” when they saw this scene? Bones, Poco and Roach. The biggest change to the basin this weekend is that our bovine winter visitors are back in town (so to speak). The cows are in from Dec. 1 until the end of February. This photo was taken near the first crossing of Spring Creek and is looking to the north-northwest. 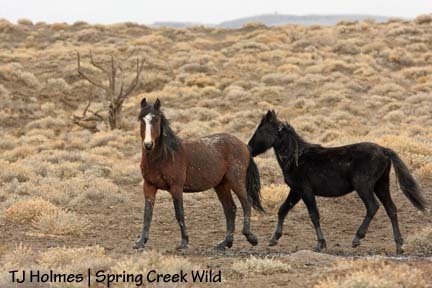 I saw other groups up in the north hills (where I did NOT see the new mares this past weekend), and there was a group east of the finger hills. Have you ever wondered if Bones could lie down – even roll – with her healed, fractured pelvis? I have, and I was wondering that again just recently. Would you believe she cooperated and showed me she absolutely can? Too bad I couldn’t divine the future from the way the “Bones” settled … 🙂 One reason I like Bones so much is her pluck. She looked so skinny last year, I named her thinking she wouldn’t make it through the winter. Not only did she survive, she has flourished! The horses aren’t always in position for me to get shots of them with the mountains in the background, but most of them were cooperating Saturday for me to get a bunch of different potential Christmas card scenes. That’s Comanche, who was turning to lead Hollywood and his girls down the trail. It was at this point that I realized Steeldust’s band really wasn’t in the immediate neighborhood. 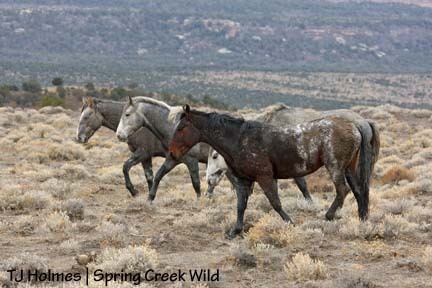 Comanche leads Aspen, Baylee, Piedra and Hollywood down a trail to an arroyo. 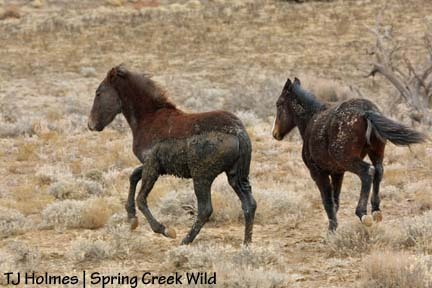 When they got to the arroyo, they dropped out of sight for a little while … I’m not sure if they got water there? You can see in this photo how much Piedra resembles Comanche in color. Chrome, Kreacher and Hook (and Duke) were about a minute behind Hollywood’s group on the same trail. If you’re wondering about bachelor Mouse, who has been after Piedra most of the year, he was the only bachelor still with the family band. That’s Knife Edge in the background. Big bay boy Duke stopped to say hi as his boys followed after Hollywood and Co. He has come a long way. He used to be pretty intolerant of people (me); now he almost seems to like me and will stop for prolonged (moments) visits. Grey/Traveler and his band were across an arroyo that emptied into the arroyo the boys (and Baylee and Piedra) went into – and I could see them ahead of us – so I trailed along with the ponies, down close to the arroyo, until I got to the silver boy and his family (remember when HE was one of the bachelors?). Big, growing girls need plenty of chow! 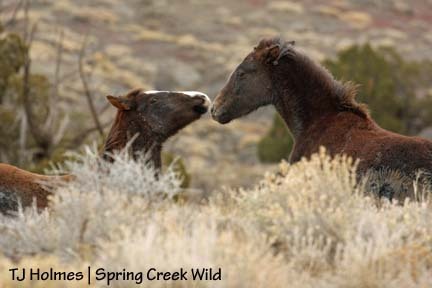 I keep thinking about telling the tour folks back in October that I hadn’t seen any of last year’s foals still nursing last fall. I’ve still seen several of the babies nursing this fall … and not just youngest baby Storm. I like the picture above particularly because it also shows Two Boots, Houdini’s yearling filly. And you know I’m not just talking about the landscape scenery! Twister is another horse with a good dose of pluck. He was an orphan in the care of two stallions (Corazon and Cinch) when I first saw him last fall. Then he found mama Houdini and Two Boots and joined the family. That’s back when Seven was the head of the family. I wish he could stay young forever so he’d always have the comfort of his adopted family, but in another year or two, Grey will likely kick him out on his own. Maybe Two Boots will go with him. They’re pretty good pals. Jif and Iya. Most of the band napped while I sat on the ground; Houdini grazed most of the time, but then she came back and stood a little in front of Iya, just to the right out of the picture. A different angle. Wise old girl Houdini has had her share of babies. Twister, in the background with Two Boots, is just one of her brood. I like how the plane of his face matches the line of Iya’s neck and body. 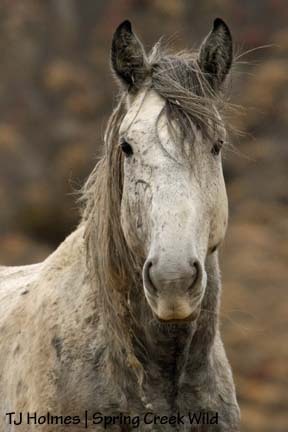 I had been keeping an eye on Seven, Molly and Roja up at the base of Flat Top while I hung out with Grey/Traveler, and that’s when I had seen Steeldust and his band up at the puddle. Eventually, they moved down, past Seven’s, toward Traveler’s and toward the bachelor boys and Hollywood’s. I walked up toward them on another trail and got into position so I could photograph them against the mountains, but they were on a mission to reunite with their boys, I guess, and they never stopped walking, grazing as they went. Consequently, I didn’t get many pix with their heads up! Sunny-boy was as muddy as Butch last weekend. He must have had a few good rolls since then. Mouse was the only bachelor still with the band. It looks like he waded into the water hole – look how deep it must be! He has mud all the way up to his belly, but it doesn’t look like he rolled in it. The “puddle” is pretty small. I don’t know if I’ve mentioned its dimensions, but I’d say it’s about 3 to 4 feet in diameter – tiny! Remember how muddy Kestrel was last weekend? She cleans up nice, eh? Kinda wild that I didn’t see Seven for almost two months, and now I’ve seen them the past three weekends – and all in the same area! And yes, I had been looking there all that time and never saw them. I do like seeing them. Seven and Roja on a short ridge at the base of Flat Top. Roja is ornery! When Steeldust’s horses came past them on the old road, I could see Roja trot out to meet them – kind of like a stallion will do. 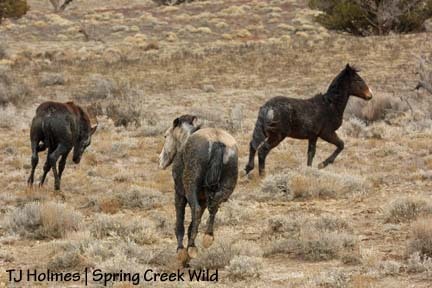 Seven stayed back on a little rise, and Steeldust’s horses seemed to be on a mission like I mentioned above, so they just ignored her; they never stopped moving until they got just a little past me and within view of the bachelors and Hollywood. Roja is a tough girl and fun to watch! Here they’re on the shady eastern side of Flat Top, late afternoon. This pic doesn’t translate very well on the Web, but in the full version, I like the almost painterly quality of the light. Old Molly got the PZP last August before she was released, so she shouldn’t have a foal next year (her 2008 filly died sometime in August). She and Roja were with Kreacher last fall when I first saw them (remember that? ); neither Roja nor Kreacher were gathered, and Roja didn’t have a foal. I expect Roja to have her first baby in the spring, and because Seven stole her and Molly from Kreacher in early March, I’m sure Seven’s the daddy. After my visit with these guys, I headed back to the Jeep and on out to beat the dark home (not successful). I looked but didn’t see Bounce, Alegre and Gaia on my way out, and I scanned the north hills the whole time I was out for the new girls, but I never spotted them. I don’t know if they know about cows, but I wonder if the “tourists” will encourage them to come down from their hilly stronghold and meet some new friends. What a gorgeous day! Chilly but gorgeous sunshine and great weather for hiking around and visiting with the ponies. The days are short, and I keep thinking about the past year, all that I’ve learned and experienced. I certainly don’t lack for peace, hope and joy this holiday season! It’s supposed to snow again next weekend, but I’m going to try to get out there because I’m taking a two-week holiday to visit my folks and home ponies, which will mean at least a three-week hiatus from the basin. That’s the most time (by far) I’ve spent away from the horses since February, but given the potential weather in December in Colorado, it’s probably the best time to plan to be away. I’m tossing around the idea of asking you, blog readers, for suggestions to name the new girls. What do you think? Can’t keep calling them “the new girls” forever, and I want people to really know these horses as OURS. 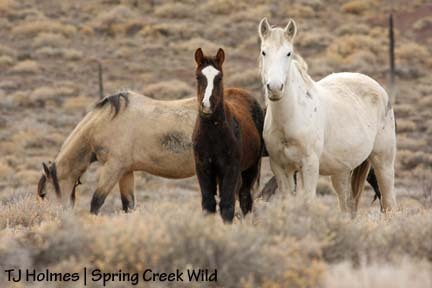 So if you have suggestions, leave a comment, and be sure to specify a name or names for each particular mare: the dun, the black pinto or the apricot dun. Thanks for coming along on this journey of discovery and joy. As much as I’ve enjoyed sharing part of the horses’ lives, I’ve enjoyed sharing what I’ve learned with you. It’s not over by any means! 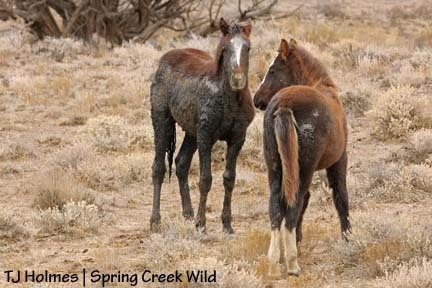 It was a little crowded at the yucky water puddle between Flat Top and Round Top (ugh; couldn’t the ponies have chosen a better watering hole?). But the craziest thing was that until I got there, I was thinking that I wasn’t going to see many horses today. We got snow/rain late last week, and the county road past the herd area was still wet and muddy in places. I decided not to tempt fate (call me paranoid) by driving the road to the basin’s main entrance, so I went down to the corrals instead. I hardly ever hike in from there because it’s a long walk to get to where you might start seeing horses. I headed toward the water catchment and the “front country” first because that’s where Grey/Traveler and Steeldust had their bands last weekend. The new girls were low on their north hills, but the area was otherwise devoid of horses. I did see someone driving out, though, so I guess the road wasn’t as bad as I had feared. It was one of those crazy beautiful days where the clouds are playing games with the sunlight. When I first got there, most of the basin was under full sunshine, but clouds looked ominous to the south and west. There was evidence of the recent snowstorm along the tops of the near ridges and the far hills. Just astoundingly beautiful. But then the clouds covered the sun, and the rest of the day was cloudy over the basin. It was mostly sunny to the north, but by the time I left, clouds had almost completely veiled the La Sal Mountains, and the basin was purple against the sunshine turning the west hills gold. 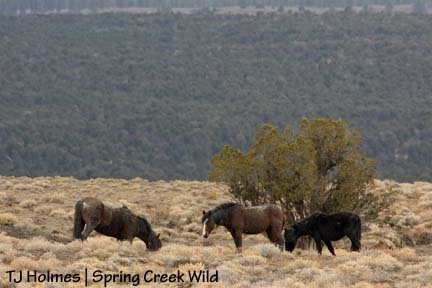 Through the binoculars, from the road past the catchment, I spotted horses way down to the southeast. I thought they were Grey’s band, but I couldn’t tell for sure, and I couldn’t tell exactly where they were. As it turned out, they WERE Grey’s, and they were a bit east of Round Top. 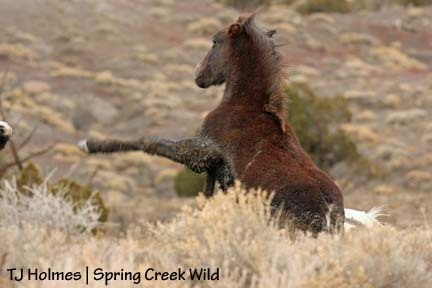 While I was heading toward them – before I realized quite how far they were yet – I spotted a black horse against the sky between Flat Top and Round Top. … Shadow? I hadn’t seen her or David for quite a while (almost as long as I had gone without seeing Seven and his girls), but I walked on up to the base of Round Top to see how far away Grey/Traveler was – and I was planning to take the Round Top trail back toward the corrals anyway. It turned out the silver boy and his family were still quite a distance from where the road ends at the base of Round Top (and where the trail takes off), so I made sure everyone was there (Iya still nursing), then hit the trail. I was feeling a little disappointed that I hadn’t seen Steeldust’s big band … Who do you suppose I found hunkered down between the Tops? Steely Dan, with some very muddy furballs masquerading as his sons and daughters! Or is that Muddiest, Muddier and Muddy?! Butch, Sundance and Kestrel (possibly siblings). You can see they’re still wet, and that’s not a shadow on Kestrel’s side; it’s her very own swath of mud. I don’t know if it was the nip in the air or something in the mud, err, water, but the ponies were feisty today! Ember was bucking around, and Kestrel, Butch and Sundance would be calm for a few moments – like in the photo above – then one would back into the other, and THEY would start playing around with each other! It was awesome to watch them feeling so good and being so silly! Innocent Storm … He’s still gullible. Is that just like a girl? She looks fierce, doesn’t she? Then she was off with Pinon (poor boy – can’t resist). Breakaway boys Kreacher, Hook and Chrome were back with the band – hanging out here with Duke. That nasty-looking dark splotch on Chrome’s face is just mud. But before Duke and the grey boys rejoined the band, Duke was thirsty enough to march up to the puddle for a drink – while David and Shadow were there. They were very respectful of each other. They’re up by Round Top there. Funny that the yucky little water hole has become such a gathering place. Maybe I’m the only one who thinks it’s so yucky?! Fun day and a great walk – four and a half hours from corrals to corrals. One great big loop walkabout. Saw 34 of the 50 horses – all but the pinto family, the pinto boys, Poco, Bones and Roach, and Bounce’s band. The ground was soft, so the basin definitely got some of that rain and/or snow, though, like here, no snow remained.